The past weekend was a long one. On Saturday we decided to go to Sepang Gold Coast to find out what it is about after we have heard so much about it. After checking with some friends, all but one has ever been there. Even then, the feedback was not that encouraging. Since we had never been there, there was nothing to lose. At least we should give it a fair try. Besides the four of us, there were another two joining us for the day trip: J and K’s aunt and cousin Joyce. After doing some simple research online, I roughly knew where we wanted to go: what to see, what to do and where to have lunch. I just printed out a map from my home to Sepang Gold Coast and its directions in words – all from Google Maps. No GPS. Whenever I travel, I love to leave some room for some “unexpected” adventures and explorations. Also I get the kick out of finding my way to an unfamiliar place. Arming with just a map and directions and nothing else, and off we went. We started our journey from Shah Alam. I avoided highways because there are more things to see on the old trunk roads. Especially small towns. We passed by Jenjarom (where the famous Fo Guang Shan Dong Zen Temple is located), Banting (it is bigger than I thought!) and Morib (another beach attraction) before we reached Tanjung Sepat. 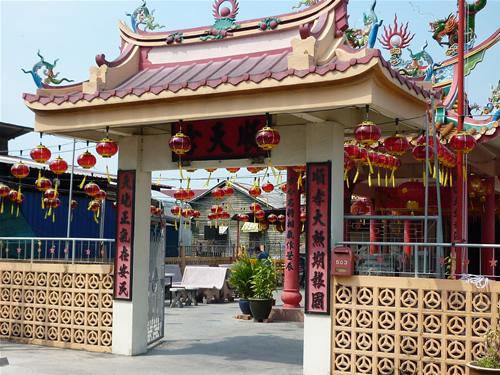 Tanjung Sepat is a small town north of Bagan Lalang, our ultimate destination. It is the last town you need to go through before reaching Bagan Lalang from the north. I did not expect to go to Tanjung Sepat first. But since Joyce was hungry and we needed a place to have a quick snack. We stopped at one of the beach front Chinese temples for a quick bite. I was pleasantly surprised to discover Tanjung Sepat is such a wonderful town. The houses are neatly arranged in paralell straight lines that form a giant rectangle – which is the town itself. Some of the houses are still in its original form – built from wooden planks and aluminium zinc. Jalan Pasar (the main road) cuts through all the roads in Tanjung Sepat. While having our snack at the beach, we met a mother there. She was born and bred in Tanjung Sepat. Naturally, I asked her about the specialties of her hometown. She told us three things: the pau/bao (steamed Chinese buns), Lovers Bridge, and a mushroom farm. She also recommended a Bak Kut Teh shop with the name of Ah Hock. The steamed fish head is nice too there, according to her. Not to mention plenty of seafood restaurants along the beach. As a food lover, the first thing I was instantly attracted to was the pau. The mother was kind enough to show me the way to the pau shop on her scooter. 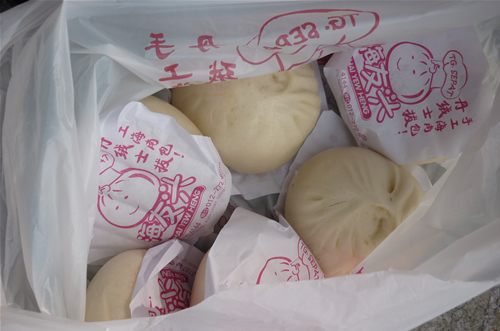 I went in to the shop at about 12 noon and bought some: pork pau (sang yok), veggie pau (muey choy), and bean paste pau (tau sar). I saw some of the workers were making some pau when I was there. They are all hand-made. The shop is called Hai Yew Heng. It is located at Lorong 4. But if you want to have hot, steamy pau, there is a cafe bears the same name opposite the shop that I went in. You can enjoy the pau with a cup of your favorite drink there. The pau is fresh but it is not to my likings. I find it too salty. But one thing I like about the pau is the skin. Maybe I should get some tau sar pau and plain pau next time I go there. Little did I know the pau shop that I went to was hugely famous among tourists. Sometimes you are not able to buy the pau just by walking in. I found out later that my friend went there twice and he did not have the chance to buy them as the shop “reserved” the pau for Singaporean tourists! Not a nice way to treat locals I guess. After we were done with our snack, we continued our journey to Sepang Gold Coast. It is another 10 minutes drive south of Tanjung Sepat. Upon reaching our final destination, I only realized that Sepang Gold Coast is the name of a resort in Bagan Lalang. What this means is these two places (Bagan Lalang and SGC) are sharing the same location/beach and the place is called Bagan Lalang. We went to Sepang Gold Coast. This is Gold Coast of Malaysia not Australia’s Gold Coast. SGC has some water villas (arranged in a gigantic palm tree shape) for sale. It is still under construction and only open to public this May or June. Why they use the name Gold Coast is beyond my understanding. As if there are no other better names that can reflect local identity. Sorry I digress… Back to the beach. To be frank, as I have found out from my friend, the beach is not fantastic to my standard. It is muddy and you won’t find fine, powderish sand there. It is far from that. Nevertheless, it is still better than nothing. Despite all that, the three kids that I took along enjoyed the beach very much. So much so that we could have our “adult time” for an uninterrupted 30 minutes. That showed how much the kids enjoyed the beach no matter what I think of it. After washing up in SGC, we were ready to have our late lunch at 3pm in Tanjung Sepat. Why Tanjung Sepat? Because there are not many eateries in Bagan Lalang and I read in one of the blogs that the blogger went to Tanjung Sepat for seafood. So I took her advice to complete our day trip with a seafood lunch at Restoran Hong Seng (on the blogger’s recommendation) – a sea front restaurant on Jalan Tepi Pantai. We ordered five dishes: steamed fish, fried baby squids, fried prawns with oatmeal, veggie, and hot plate tofu. I like the fish and prawns. The squids were too soggy and not crunchy enough. The bill came to about 85 bucks which I think is reasonable. As you may now know, the town is famous among tourists for its food. I might go to Tanjung Sepat again for Ah Hock’s Bak Kut Teh and others. The trip was awesome. I got to enjoy my drive and explorations of two new towns: Tanjung Sepat (which led me to the discovery of Tanjung Sepat’s pau) and Bagan Lalang. 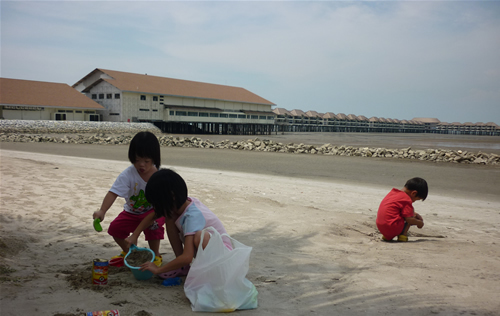 For the kids, they got the chance to enjoy the beach. Simply perfect! If you are looking for ideas on where to go on weekends with your children, put this as one of your destinations.